Do you have a Truth and Reconciliation Commission (TRC) reference number? 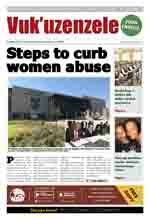 The government is calling on people who appeared before the TRC and were confirmed to be victims. They should come forward and collect R30 000 symbolic reparation (payment made to a particular person or a group of people as damages for loss) for the suffering they went through. Only those who were declared as victims by the TRC should approach the Department of Justice with their TRC reference numbers. The Department of Justice has reported that there are 1052 people who could not be traced. These people could have moved to new addresses or may have passed away. The Department is negotiating with the families of victims who have passed away to find out who the beneficiaries are so that the remaining money can be paid to them. 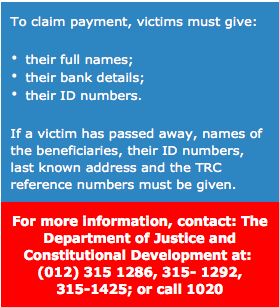 Government is asking community-based organisations to help in the search for people who have not claimed their payment.